In 2018, Armenia was going through dramatic changes. From April to May of 2018, anti-government protests erupted resulting in the change of government with high hopes for tilting the existing balance of power, reforming different areas of governance, including the current anti-corruption system. With the new government in place, optimism is on the rise in Armenia, which extends to all areas interesting for the TPPR network. 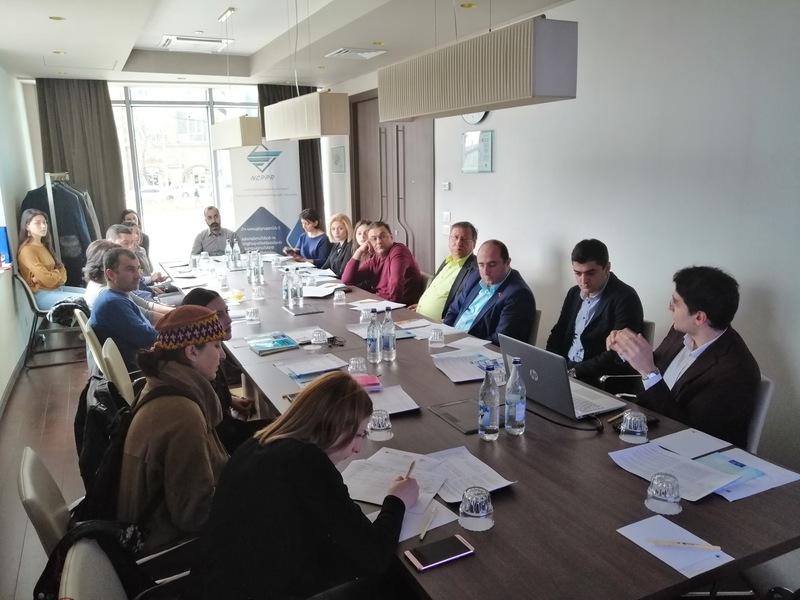 With current developments in mind, on March 23rd, 2019, TPPR network held an advocacy meeting in Yerevan to discuss Armenia’s Public Procurement Legislation Assessment results. The results focuses on two major PPL assessments based on the TPPR Methodology – 2016 and 2019. The Institute for Development of Freedom of Information (IDFI) together with its partner National Center of Public Policy Research (NCPPR) held a meeting with representatives of the Ministry of Finance, procurement specialists of major procuring entities of Armenia as well as the civil society. The advocacy meeting focused on the improvements made since the first assessment of 2016 and how the score improved, while at the same time offering proposals on how to further enhance the public procurement system. In 2016, Armenia scored rather low on the TPPR index, with only 59,7% compliance with the standard, leaving major areas such as transparency, efficiency and accountability vulnerable. However, over the period of 2 years, Armenia managed to improve its PPL significantly. Levels of transparency, efficiency and accountability related legal safeguards increased significantly. Most importantly, the public procurement information portal ARMEPS (PPCM module) currently provides much of the existing data in machine-readable format (CSV) and in Excel, which was not the case in 2016. Nevertheless, improvements can be made and the visit focused on areas most important for the healthy performance of the public procurement system. 2018 data on ARMEPS shows that the number of registered users in ARMEPS is on the rise. In 2011, there were only 125 registered suppliers, in 2012 – 1,000, in 2013 – 1,425, in 2014 – 2,555, in 2015 – 4,391. At the end of reporting period (2017) there were around 5,500 registered economic operators. This growing trend is a positive sign, however the number of economic operators in the system needs to increase. For example Georgia, which is a country of a relatively similar population, territory, economic capacity and output, has almost 35,000 registered users on its e-procurement system. The low number of registered users reflects the low level of average competition per tender in Armenia, which is at 1,9 participants on average. One of the things Armenia could do to attract more users for e-procurement is to shift towards full electronic procurement. According to Article 8 of the Law on Public Procurement - Within the scope of the functions defined by the law, communication between procuring entities and economic operators can be carried out electronically, and the announcement and invitation may be provided electronically. Therefore, electronic procedures are an option, not an obligation. One of the information portals on public procurement “procurement.am” shows that paper-based procurement outnumbers e-procurement significantly. This implies that a fair portion of economic operators may not be interested in registering on the e-portal. By making e-procurement a default procedure, the number of registered suppliers will increase, making information gathering and monitoring of the procurement system more reliable and trustworthy, in addition to potentially boosting competition. Out of 14,233 contracts (available in ARMEPS portal), which constitute 180,1 bln AMD, 5,820 contracts (41%) constituting 87,8 bln AMD (49%) are done via non-competitive methods. Therefore, competitive procurement procedures account 59% in number and around 51% in volume. Out of 5820 non-competitive contracts, around 4,062 are below threshold (1 mln AMD). In total these single source below threshold contract volume is around 0,9 bln or 0.5% of the total spending on public procurement. Hence, a fair portion of the financial resources are spent through non-competitive procedures. This does not mean that all such procurement can be faulty or mishandled, nevertheless, non-competitive procedures still pose a higher risk for corruption. Armenia, should work on reducing the use of non-competitive procedures and there are different methods to be relied upon. IDFI’s recommendation was to use a system similar to that of Georgia, where single source procurement needs a prior approval, with standardized questions filled in by the procuring entity (transparency of the process ensured through a separate module in the e-procurement system). Transparency related guarantees can further be improved to ensure compliance with the TPPR standard. The graph below shows that contract performance information along with payments, inspection of quality reports and audit reports can be ensured to be public through the law or a sub-legal act. This would be fairly easy to do, considering the fact that part of information is already being published in practice on ARMEPS. Yet one of the most important things Armenia can do is to unify all procurement portals it currently operates. ARMEPS and procurement.am host vast amount of information. ARMEPS hosts information in machine-readable format, whereas procurement.am in electronic formats such as – Word or PDF. It would be reasonable to unite the two, so that information tracking on individual tenders is easy. For example if one wishes to see contract amendments on a certain tender in detail, procurement.am can be used, while at the same time, contract information on the same contract is stored on ARMEPS. This makes the use of e-resources inconvenient and may hinder external monitoring process. Overall, Armenia has made strides towards more efficient and transparent public procurement system and currently a new wave of reforms is looming. Throughout the advocacy visit, IDFI and its Armenian partner NCPPR attempted to convince relevant stakeholders that TPPR network recommendations coupled with the energy of the new government and the will to reform can bear fruit and make the e-procurement system more efficient, reliable, transparent and accountable.